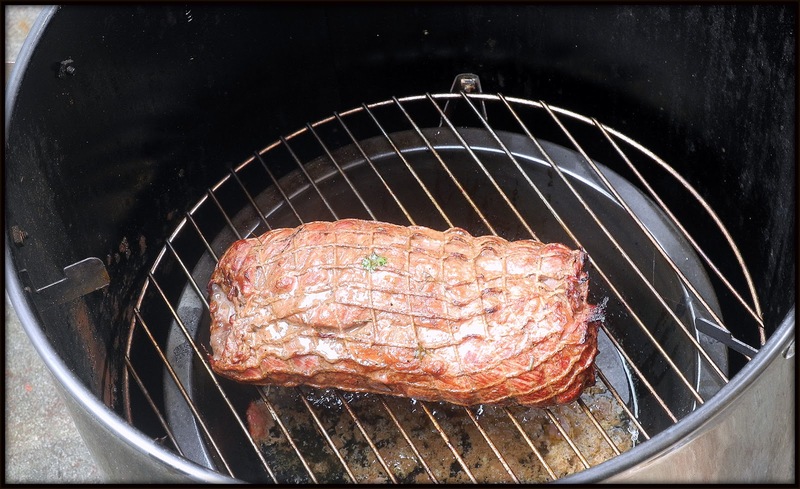 Smoke meat is unto itself. It carries the smokiness in the taste and that gives the meat, a real style of its own. We took a 3 pound roast and marinated it overnight. Threw out the marinade and put it in the smoker for hours. My husband used a meat thermometer to tell when it was done. In a closed jar or plastic container with fitted to, put all liquids and shake, shake, shake. Add the seasoning and again do that shake. Build muscles, while you are shaking. Place meat in a large bowl. 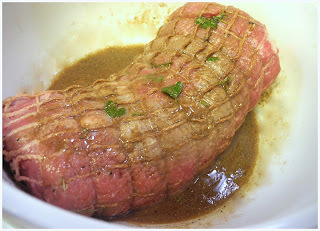 Cover with the marinade and let stand overnight, basting every few hours (when not sleeping). Cook in smoker according to the directions. Eat, drink and be hearty. 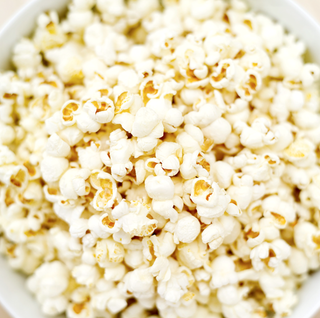 Coconut Caramel Popcorn from the Lazy Budget Chef - what fun. 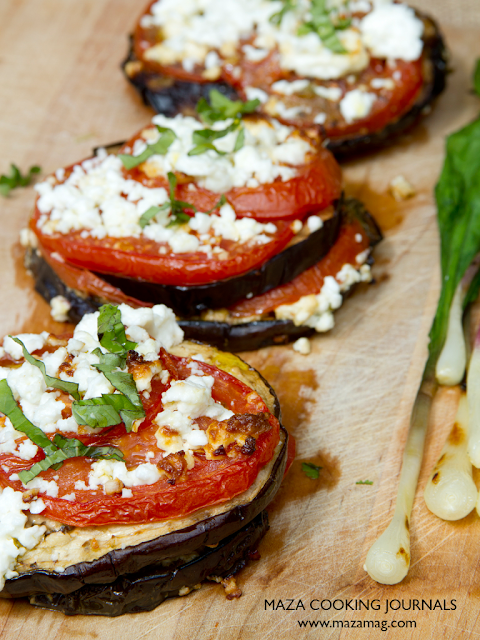 Grilled Eggplant with Tomato and Feta from Define Inspiration - Mind- Body - Soul this could be my dinner tonight. I have an appointment now and I must scoot. These should keep you happy for a while. We do have great cooks filling the recipe box. Be a great cook and please put in your recipe, for this coming week. I'm thrilled that you feature my Cheesecake, thanks soooooooooo much. Loving your features especially the grilled eggplant. I'm all about eggplant this week. Thanks for the invitation to the party. Thank you for hosting, Chaya! Great selections of recipes you got last week and this week is already off to a great start! Thanks for hosting Chaya! The featured cheesecake looks outrageous; great features. Thanks for hosting. I linked a brownie that is spicy, raw and vegan. I love ordering smoked meat, but I've never made it. Thanks for another party! I've been thinking of getting a smoker. This looks awesome! Hi Chaya! Thanks for hosting again. 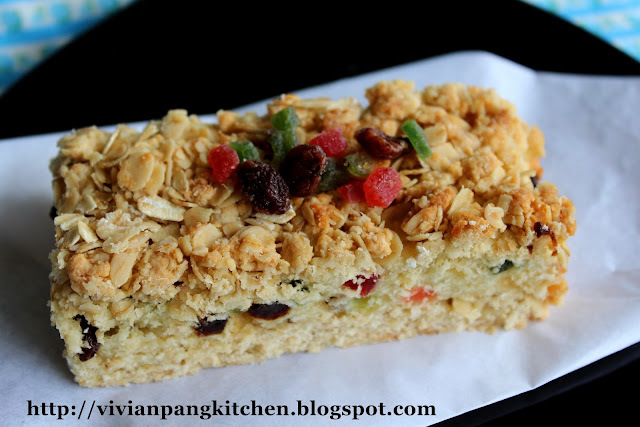 :) The features look great, especially Winnie's Cake and the Grilled Eggplant! Thanks again for featuring another recipes of mine in your party. Your marinade sounds just delicious! I love all the wonderful flavours you have used - they would really compliment the smoked meat. Your smoked beef looks scrumptious! I've just linked up some sesame rolls. Thank you for hosting! The roast looks perfect! Thanks for sharing and thanks for hosting ☺ I'm linking up my Stuffed Zucchini Boats this week. Have a great one! Good morning, Chaya! Just linked some Chinese stir-fry chicken. Thank you for hosting, have a lovely weekend! I love all the amazing food linked up here and off to check out all the wonderful recipes. Thanks so much for hosting and have a great weekend! I've linked something refreshing. No cooking or baking, just fresh and delicious! Have a great week!